Best friends Toucan, Giraffe and Penguin all have something special about them but it takes the others to point it out. Giraffe feels he is too tall, Penguin wants to fly, and Toucan is embarrassed by his big yellow beak. But they discover that they can use their differences to help each other. 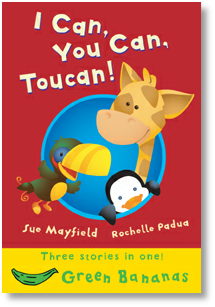 Three short stories about friendship and celebrating differences, suitable for ages 4 and above.